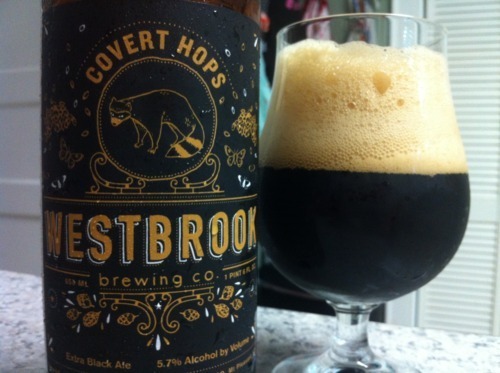 Westbrook Covert Hops | Drink. Blog. Repeat. I was able to try Covert Hops on draft during a recent trip down to Westbrook and the South Carolina coast and have been meaning to pick up a bottle of it. That was about two months ago and I didn’t get around to grabbing a bomber until this past weekend. While I was worried the hops in Hops would die down a bit, I was happy to find that it was just as roasty and hoppy as I remember it. As the bottle would hint, Covert Hops pours black with a gigantic head on top. I was worried the bottle was a bit over-carbonated, but after reading some more reviews I realized I wasn’t alone. Of course, the lacing is really nice on it, but at just under 6%, there’s no alcohol legs. The roasted malts and piney hops are the most prevalent on the nose. There’s a hint of bitter dark chocolate and just a very slight hint of dark fruit, giving it a slight sweet character. That characteristic black IPA smell is what’s the most present, though. There’s a big bitterness on the front of the tongue. The piney hops come through huge in the middle of the mouth. (There are 4 lbs. used in each batch.) The roasted notes reappear on the back with a big bitter black coffee taste. It’s a very light-bodied beer, which is in contrast to its appearance. Maybe a bit too watery, but awfully drinkable. Quick side note: While they’ve been around for just more than a year, Westbrook has some of the best labels I’ve seen. Each beer is unmistakably Westbrook, with the name featured very prominently below each central design, but the labels themselves are littered with all these little drawings across them. But what I appreciate the most is that each bottle includes a short description of the beer, the suggested serving temperature, the proper glassware and an easily noticeable bottling date, four things EVERY craft brewer should have on their label. Cheers to Westbrook for eye-catching yet informative artwork.